If you've ever work in tech support, you've undoubtably had users tell you "the Internet is down". As a techie, you're pretty sure that no one pulled the power cord from the Internet. Something must be going wrong somewhere between the user's chair and the Internet. Assuming its a technical problem, you begin to search for the problem. Perhaps the user's computer is turned off, maybe their network cable is unplugged, or perhaps your organization's core router just took a dive. Whatever the problem might be, one thing is most certain - the Internet isn't down. It just happens to be unreachable for that user. 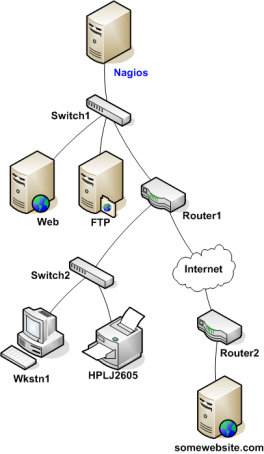 Take a look at the simple network diagram below. 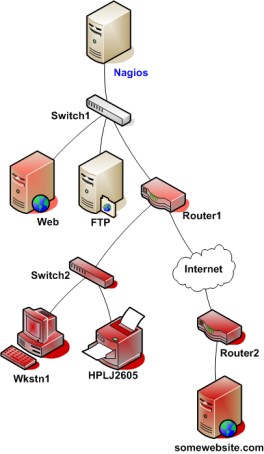 For this example, lets assume you're monitoring all the hosts (server, routers, switches, etc) that are pictured. Nagios is installed and running on the Nagios host. When hosts change state (i.e. from UP to DOWN), the host reachability logic in Nagios kicks in. The reachability logic will initiate parallel checks of the parents and children of whatever hosts change state. This allows Nagios to quickly determine the current status of your network infrastructure when changes occur. In this example, Nagios will determine that Web and Router1 are both in DOWN states because the "path" to those hosts is not being blocked. Nagios will determine that all the hosts "beneath" Router1 are all in an UNREACHABLE state because Nagios can't reach them. 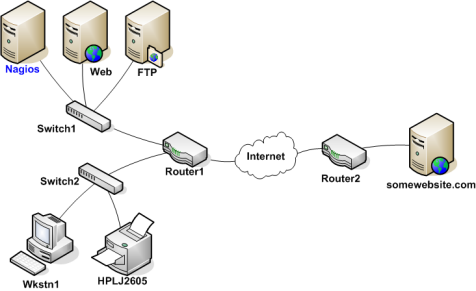 Router1 is DOWN and is blocking the path to those other hosts. Those hosts might be running fine, or they might be offline - Nagios doesn't know because it can't reach them. Hence Nagios considers them to be UNREACHABLE instead of DOWN. By default, Nagios will notify contacts about both DOWN and UNREACHABLE host states. As an admin/tech, you might not want to get notifications about hosts that are UNREACHABLE. You know your network structure, and if Nagios notifies you that your router/firewall is down, you know that everything behind it is unreachable. If you want to spare yourself from a flood of UNREACHABLE notifications during network outages, you can exclude the unreachable (u) option from the notification_options directive in your host definitions and/or the host_notification_options directive in your contact definitions.